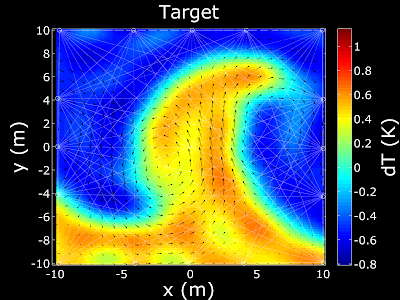 One of the projects that I'm currently working on is a method of measuring temperature and velocity fields using sound, called acoustic tomography. This method relies on the two properties of sound: it's speed is temperature dependent, and the sonic speed is relative to the motion of the fluid (in our case, air). The principle is similar to that used for sonic anemometers, the time taken for a sound to cross a distance is measured in two directions and the mean wind speed and temperature can be determined. If we set up a large number of speakers and microphones around a measurement area, it is possible to reconstruct the temperature and/or velocity fields within the area. This can be used to generate an image or video of the temperature and wind distribution. This has been done before, however we are looking at much smaller scales in order to measure the flow in street canyons. For more information, see my paper at the New Zealand Acoustic Society conference. Example code is also available from my section of the Matlab File Exchange. The image above shows the temperature (colours) and wind velocity (arrows) field for votex shedding behind a cylinder. 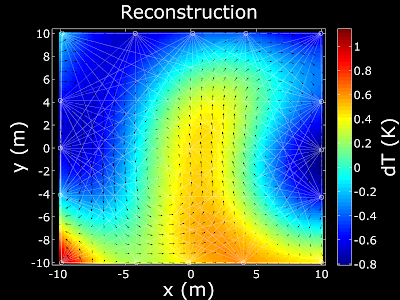 The top image shows the simulated flow, and the bottom one shows the reconstruction. The video below shows multiple frames of similar data. Unfortunately the resolution is low, if you would like to see the full video, please contact me.